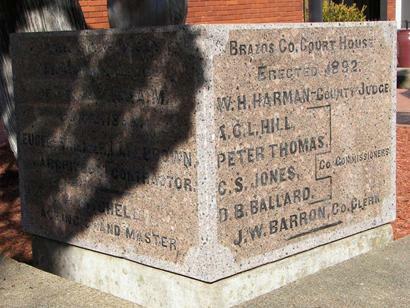 Brazos County Hires an Iowan to Raze their 1892 Building. 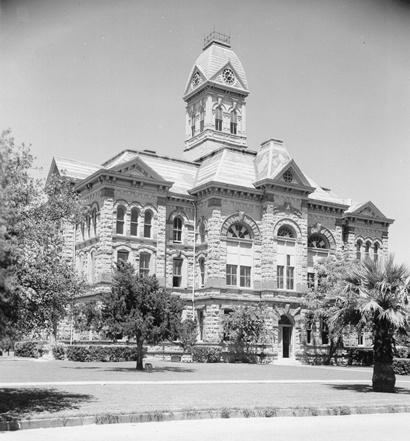 Way back in 1954, before "urban renewal" entered the American vocabulary, county commissioners of Brazos County decided that they needed a new courthouse. The one they were using was sixty-two years old and was looking every month of it. Besides, it had always been considered a little "fussy" to some Brazos Countians. All that rough-cut stone was distracting and the tower was downright... Victorian. Tower-less buildings of smooth concrete and glass bricks were going up all across the country. Why should Brazos County be stuck with this old eyesore? As in most courthouse replacements - the new building was to occupy the same space as the former. 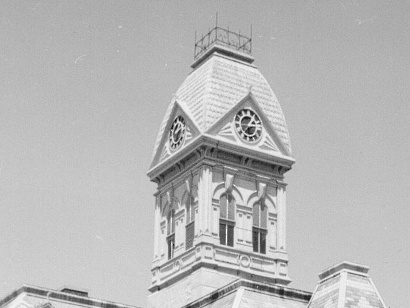 In mid-August, 1954, shortly before demolition was to begin in earnest, the Bryan Daily Eagle interviewed the man who was to supervise the work. The story was right there on page one - right alongside the articles "Studebaker Workers Vote to Take Pay Cut," "Japan Has Risen from Ruins, But Near Broke" and "Controversial Anti-Red Bill Goes to House." The story ran under the headline "Wrecking Boss Likes His Work." Ted Hall, was a beefy Iowan that had turned in his bid to demolish the courthouse without even looking at the building. He agreed to complete the job within fourteen working days which surprised everybody involved. Because of the sheer volume of the building, it was a Herculean feat - if the deadline could be met. The contract (no monetary figure was given) may have been awarded to Hall just to see if it could be done. Hall, who had torn down buildings in 14 states (presumably with permission) said that he had already razed over 300 buildings this size or larger. He set up his trailer on the north side of the square and with his crew of six started dismantling. When interviewer Ray McGehee asked about equipment, Hall asked "What equipment?" He explained that it was cheaper to hire a local bulldozer by the day and extra local laborers. 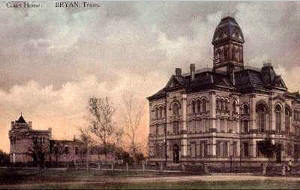 At the peak of destruction, Hall had 30 workers pounding, prying, pushing and pummeling the old courthouse into gravel. Neither Hall nor his interviewer had much to say about the doomed building. Not even a single "they-don't-build-'em-like-that-anymore" remark. A few days into the operation reporter McGehee said "thus far in his Bryan operation Hall has had only minimal accidents - cut hands and mashed feet." None of the aforementioned appendages belonged to Mr. Hall who kept a safe distance from falling debris. Hall spent his day answering requests for salvaged lumber and flooring. Although he, himself was safe from injury, he pointed out that "Deep-sea diving is the only business that carries a higher insurance rate than demolition." But Reporter McGehee did seem to get a little sentimental when speaking of the old courthouse clock. "Old and tired, the clock gave up and stopped several years ago. [But it] had gained a place in the hearts of Bryan people with its time-telling chimes that could be heard day and night..." But if this was true sentiment, he snapped out of it with his next line: "so it is fitting that this old masterpiece should be the first to come down." The Seth Thomas clock was "unceremoniously" thrown off the top of the building into a twisted mass of junk. The timbers supporting the tower were found to be 6 x 14 inch heartwood (although the tree species wasn't mentioned). This massive wood frame slowed them a bit but McGehee reported that "after five official working days the wreckers have rendered the building a broken twisted hulk." The clippings of the courthouse's death and removal ended abruptly. The paper went on to other, more pressing subjects. Nothing is known of the clock's final resting place or if the building stone was sold in cut form or simply used for fill. It seems that once the walls were pulled down there was nothing to interest the public until construction began on the new courthouse. But the casual, cold-hearted smashing of the clock was noted by the National Association of Watch and Clock Collectors Bulletin in their February 1988 edition. The cornerstone is now on display in front of the main entrance of the new courthouse, and the bell on display in the new courhouse lobby. 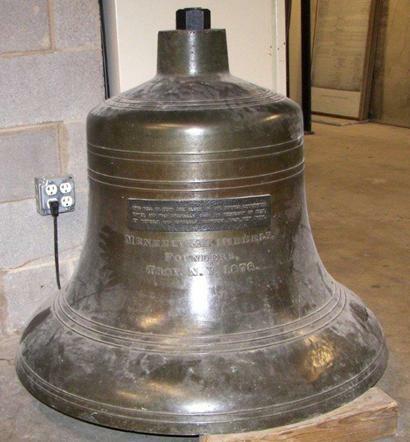 The bell from the 1892 Brazos County courthouse actually predates that courthouse by fourteen years. 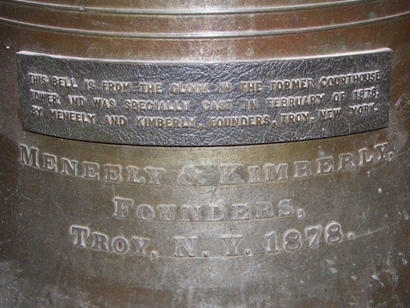 The plaque on the bell reads: This bell is from the clock in the former courthouse tower and was specially cast in February of 1878, by Meneely and Kimberly. Founders, Troy, New York. 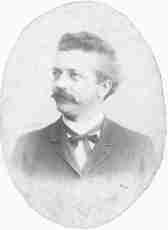 Eugene Heiner, the building's architect, had died only a few years after the building's completion so he was spared witnessing the undignified end to his design. 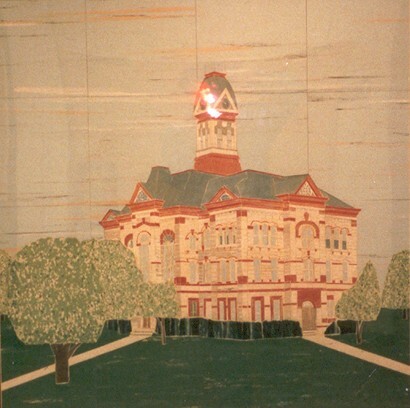 A mosaic of the old courthouse, composed of tiles from the Heiner building and arranged by a former Brazos County Judge is on display in the current courthouse. The mosaic "made from tile from the demolished 1892 courthouse in 1965." I was at the Brazos county courthouse recently and took a picture of the mosaic made by one of the judges. 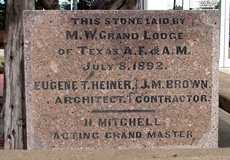 It was made from tile from the demolished 1892 courthouse in 1965.